The head of the Organization of American States said Friday he has found no willingness among leaders of Honduras’ interim government to return President Jose Manuel Zelaya to power. “They have, for the moment, no intention of reversing the situation,” Secretary General Jose Miguel Insulza told reporters. He said he had reached that conclusion after speaking Friday with members of the Supreme Court, among others. Insulza also rejected assertions by the interim government that the change in leadership was not really a coup d’etat. “I don’t know what else you would call it when a group of military take a president out of power and sends him to another country,” he said. In a televised response, Vice Chancellor Martha Lorena de Casco said Honduras was prepared to withdraw from the OAS, which she called a political organization rather than a tribunal of justice. “Honduras will defend its sovereignty,” she said. Zelaya was ousted in a military-led coup Sunday and sent to Costa Rica in his pajamas. The same day, the Honduran Congress voted to install Roberto Micheletti as interim president. That sparked international condemnation, with the OAS on Tuesday passing a resolution calling for Zelaya’s reinstatement by Saturday and threatening to suspend Honduras from the group. Zelaya has said he will return this weekend with presidents of other OAS member countries, despite Micheletti’s vow to have him arrested for violating the country’s constitution if he does so. On Friday, thousands of people assembled in front of the presidential residence in Tegucigalpa, where Micheletti praised the armed forces for their efforts and offered a different version of events. “We must tell the world that there was no coup d’etat here,” he said, his voice hoarse. “It wasn’t a coup! It wasn’t a coup!” He promised that the nation would revert to a democracy, but did not say when. “Here, in front of Honduras and the entire world, I guarantee we will have free elections, as soon as we decide when,” he said. Micheletti has promised not to run in elections slated for November. “You may choose any candidate from any party,” he told the crowd. “I want to tell you that I am governing for all political parties. I am governing for the poor, for the businessmen, for the rich, for the children and for all the people of Honduras.” Though the two sides appeared far apart, a compromise might be possible, said Jennifer McCoy, an Americas expert at the Atlanta, Georgia-based Carter Center. “The options are that neither side backs down and that President Zelaya shows up tomorrow and the police are there waiting to arrest him.” If Zelaya returns accompanied by international figures, the result would be “awkward,” she said. McCoy added there could be “some kind of compromise, including mutual guarantees.” One such scenario — Zelaya’s promise not to pursue legal action against the coup plotters in exchange for their agreement to step aside and not to pursue his Cabinet ministers who are in hiding. McCoy praised U.S. President Obama for supporting Zelaya without qualification. “By taking the principled stand for democracy that he took in this case in favor of a government that is an ally of Venezuela, he did not let politics intervene. This is a change from the previous administration,” she said. McCoy was referring to the tacit U.S. approval that was given to the coup that in 2002 briefly toppled leftist Venezuelan President Hugo Chavez, who has been a consistent U.S. critic. “It helps to recuperate the pro-democracy credential of the United States in this hemisphere,” she said. Meanwhile, Amnesty International accused the new government Friday of intimidating media workers. “Recent reports suggest that journalists who have published news stories on the crisis or covering the issue of protests and scores of detentions have been intimidated,” it said. “Prosecutors have also reported threats on account of their attempts to verify human rights abuses during protests.” At the center of the dispute was a referendum that Zelaya had vowed to carry out last Sunday even after the country’s supreme court and congress declared it would be illegal. The nonbinding referendum could have opened the door to the creation of a constitutional assembly to modify the country’s charter. Opponents accused Zelaya of having sought to rewrite the constitution to allow him to run for re-election. Zelaya denied that was his intent. However, international support for the new government has been virtually nonexistent. On Thursday, the European Union announced that all its ambassadors had left Honduras. Also Thursday, the U.S. State Department said it was suspending some aid programs to the country. Earlier, the U.S. military, which has trained Honduran forces for years, postponed some planned exercises with the Honduran military until the situation in the country settles down. 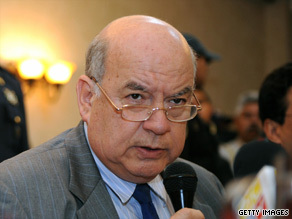 Zelaya narrowly won the presidency in 2005 with 49.8 percent of the vote to 46.1 percent for Porfirio “Pepe” Lobo. After 18 years of nearly uninterrupted military rule, Honduras returned to civilian control in 1981. Since then, the military has not seemed interested in holding power in the nation of more than 7 million people, about 70 percent of whom live in poverty. Military interventions were once common in Latin America, but civilian governments have held sway since the 1980s. Before Sunday, the only other barracks revolt this decade was the unsuccessful 2002 coup attempt against Chavez, when the military displaced him but backed down days later and allowed his reinstatement.